Organic farming is a sustainable agricultural system that respects and relies on natural ecological systems. Its principles exclude the use of synthetic pesticides and fertilizers. Instead it is based on management practices that sustain soil quality and health. Composting of organic residues and the use of compost in agriculture bring back plant nutrients and organic matter to the soil that otherwise would be lost. Nevertheless, there are some potential risks associated with compost use, such as the accumulation of heavy metals or organic pollutants, which must not be neglected. Some types of organic farms, such as stockless farms or vegetable farms, have difficulties sustaining soil humus using only organic farming sources. For such farms, using biowaste compost from separately collected organic household waste might be a solution, which in addition helps to close nutrient and organic matter loops of the whole society. Here we compile information on beneficial effects and potential risks associated with compost use and on crop yields and quality, with compost under an organic farming perspective. The most important benefit of using compost is the increase in soil organic matter (SOM). Under temperate climate conditions, 6–7 t ha−1 year−1 (dry wt.) compost is sufficient to maintain the soil humus level of medium-textured soils; higher rates increase the soil humus content. Regular compost addition enhances soil fauna and soil microbial biomass and stimulates enzyme activity, leading to increased mineralization of organic matter and improved resistance against pests and diseases, both features essential for organic farming. 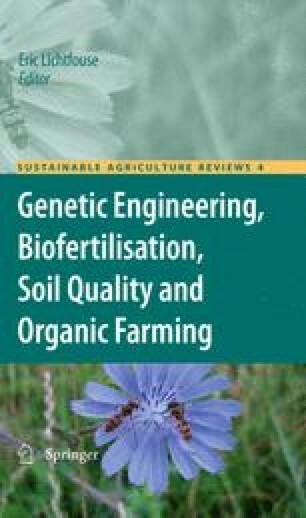 Through the significant increase in the soil’s content of organic carbon, compost fertilization may make agricultural soil a carbon sink and thus contribute to the mitigation of the greenhouse effect. Phosphorus and potassium in compost become nearly completely plant-available within a few years after compost application. The nitrogen-fertilizer value of compost is lower. In the first years of compost application, N mineralization may vary from −15% to +15%. Nitrogen recovery in the following years depends on the site- and cultivation-specific mineralization characteristics and will roughly be the same as that of soil organic matter (SOM). Soil cation exchange capacity (CEC) increases with compost use, improving nutrient availability. Moderate rates of compost of 6–7 t ha−1 year−1 dry wt. are sufficient to substitute regular soil liming. In the available micronutrient status of the soil, only minor changes are to be expected with high-quality composts. Increasing soil organic matter exerts a substantial influence on soil structure, improving soil physical characteristics such as aggregate stability, bulk density, porosity, available water capacity, and infiltration. Increased available water capacity may protect crops against drought stress. Plant-disease suppression through compost is well established in container systems. In field systems, the same processes involving the suppression of pathogens by a highly active microflora supported by the supply of appropriate organic matter are likely at work. When using high-quality composts, such as specified by the EU regulation 2092/91, the risk of heavy metal accumulation in the soil is very low. Nitrogen mineralization from compost takes place relatively slowly and there are virtually no reports of uncontrollable N-leaching. Concentrations of persistent organic pollutants such as polycyclic aromatic hydrocarbons (PAHs), polychlorinated biphenyls (PCBs), or polychlorinated dibenzodioxins and dibenzofurans (PCDD/F) in high-quality composts usually approach the usual soil background values. Also the overall hygiene and hygiene concerning plant diseases and weeds are not a problem if quality composts produced in a monitored system are used. Most studies found positive yield effects of biowaste compost. However, the effect of biowaste compost applied at moderate rates usually takes some years to develop. It depends on the factors determining nutrient mineralization from soil and compost and also on crop-related factors such as the nutrient requirements and uptake dynamics of the respective crop rotation. Crops with longer growth periods can make better use of compost. Many vegetable crops respond favorably to compost fertilization, often immediately after the first application. Crop quality is usually not affected by compost fertilization in cereals and slightly positively influenced in vegetable crops.